Make a bold statement with the 2017 Ford Fusion. People will be impressed by the attractive exterior, with flowing lines and a strong, sporty front end. Punctuating that design are athletic powertrains that also help conserve fuel. Your friends and family will be couched in comfort, with useful features surrounding them in the cabin, making your car a favourite family sedan. Ford offers five dynamic models for the 2017 Ford Fusion, called S, SE, Titanium, Platinum and Sport. They allow you to easily select the level of luxury and included equipment on the car. You also get to choose one of several available engines for the Ford Fusion. The base 2.5-litre four-cylinder engine produces a peak 175 horsepower and 175 lb.-ft. of torque. Ford offers it with either front-wheel or all-wheel drive, making it great for the harsh Canadian winters. For greater fuel efficiency and even better performance, choose the 1.5-litre EcoBoost four-cylinder. By combining turbocharging with direct injection, it pushes out 181 horsepower and 185 lb.-ft. of torque. If you're looking for even more thrills, the 2.0-litre EcoBoost four-cylinder engine provides just that. It produces a peak 240 horsepower and 270 lb.-ft. of torque for strong acceleration, and the ability to simply pass other cars on the highway. All-wheel drive is optional with this engine. Choosing the Ford Fusion Sport means you benefit from a wondrous 2.7-litre Ecoboost V-6 engine. Pressing on the accelerator, you command 325 horsepower and 380 lb.-ft. of torque. This engine is only paired with all-wheel drive, for incredible performance all around. 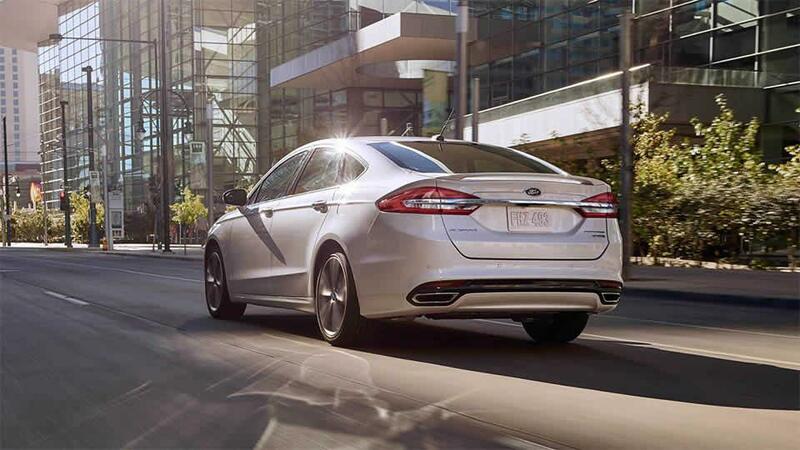 You also get continuously controlled damping with the Ford Fusion Sport, for a balance between comfort and control. This system includes an advanced technology that reads imperfections in the road ahead, adjusting the damping to cushion against damage. It even guards against the discomfort and potential damage resulting from large potholes. While the Ford Fusion certainly is fun and helps to save on fuel, you also benefit from the passive and active safety features. Among them is individual tire pressure monitoring. Unlike other systems that tell you one tire is low and needs some air, leaving you to guess which one, this system tells you exactly which tire to refill. It even monitors the spare tire, so you're prepared for emergencies. Standard AdvanceTrac with electronic stability control employs two gyroscopic sensors to measure the roll rate and yaw rate of the car. It alloys the system to manipulate the brakes and throttle to keep things under the control, and the sedan going in the right direction. The advanced technologies don't just monitor for safety threats. Adding the optional Sync 3 system gives you access to advanced voice controls, so you can change the music, get directions or perform other duties without taking your hands off the steering wheel. Other interior amenities include satellite radio, leather upholstery, ventilated/heated seats, a power sunroof and more. Getting behind the wheel of the Ford Fusion is a feeling you don't forget. Contact us to set up a test drive.